It is already "Back to School" Season and before we know it, it will soon be a new school year heralding a year filled with knowledge, laughter and fun! As we look forward to yet another promising new academic year for our children, let us pause for a moment and think about our less fortunate brethren for whom even the basic necessities like school supplies remains an unachievable dream!
" Danam" or "Charitable Giving" is the cornerstone of our religion- Sanatana Dharma and it is emphasized that the Dana of knowledge is of the highest order! 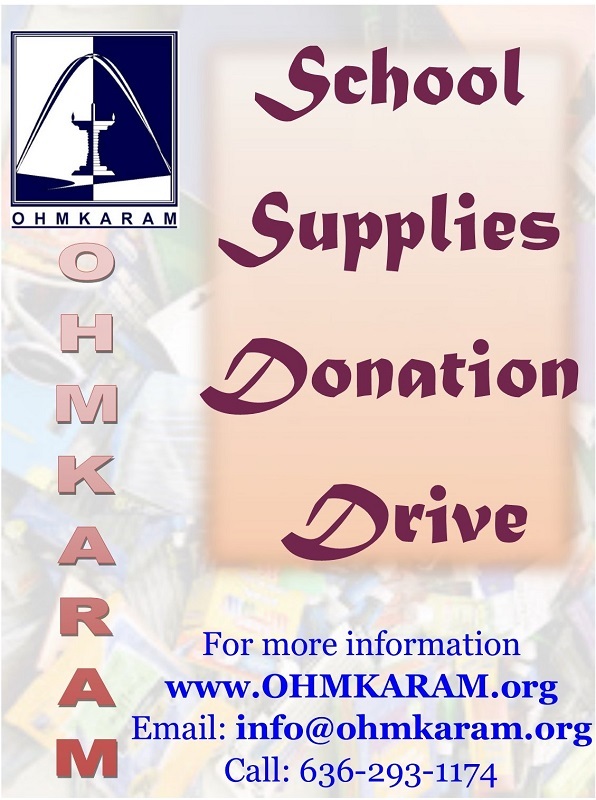 With this lofty ideal in mind, Ohmkaram has embarked upon a “School Supplies Donation Drive", wherein we encourage all our members to donate generously towards this noble cause. Please purchase any School Supplies Item from the list specified below and drop them off at the homes of any of our Executive Committee Members between now and Sunday, August 5th 2018. There is no minimum number of items to be donated nor is there a cap on the maximum. We will be collectively delivering these items to a specific location and will keep all the donors informed. All donors are encouraged to join us when we drop off our donations. Please feel free to reach out to any of the Executive Members for any further clarifications needed. Looking forward to your whole-hearted participation and support as always!